Is Michael Del Zotto the Vancouver Canucks Number One Defenceman? Is Del Zotto the Canucks #1 Defenceman? The Vancouver Canucks were going to need a ton of luck in order to remain competitive this year. They were going to need more goals, better goaltending, better defence and be healthier. It’s early to judge on a number of those areas, but let’s just say the question marks have not disappeared. One thing we know for sure is that the Canucks have been hit by the injury bug early. They lost Loui Eriksson for 4-6 weeks to a knee injury, although no one in Vancouver seems too concerned about that. The one that should concern Canuck fans is the knee injury that has knocked Alex Edler out for 4-6 weeks. Head coach Travis Green recognized the weakness on defence heading into the season, so he reunited Edler and Chris Tanev and the two defenders give the Canucks their best shutdown pairing. With Edler out of the lineup, Michael Del Zotto is being used like a number one defenceman. Back when Del Zotto was a rookie, he was steadily playing his way towards becoming the number one guy on the back end. He impressed many and even received some votes for the Calder. He suffered the dreaded sophomore slump but then broke out in his third year with a career-best 10 goals and 41 points. His ice time also jumped to more than 22 minutes per game in a season where he was 12th in Norris Trophy voting. Del Zotto averaged more than 23 minutes per game in an injury-plagued fourth season, but in his fifth, he was utilized like a completely different player. In that season, he split time between the New York Rangers and the Nashville Predators and his ice time dropped, averaging a shade over 17 minutes per game. 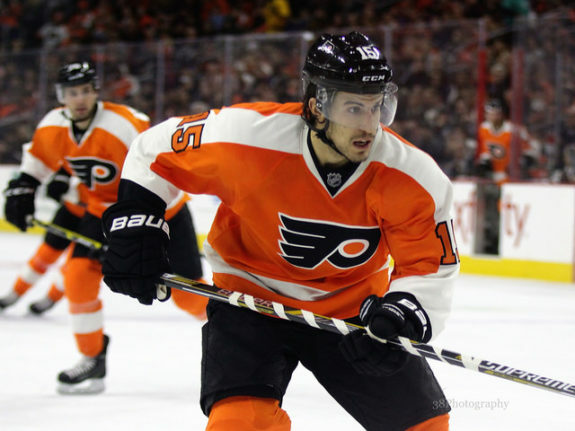 In Philadelphia, Del Zotto worked his way back up. He was playing 22-23 minutes per night during his first two seasons with the Flyers, but again last season his average ice time dropped to 19:30 per game. The beleaguered Andrew MacDonald was even playing more than Del Zotto. It’s the erratic playing style of the 27-year-old that’s contributed to his roller-coaster, nine-year career. He’s always had the offensive tools to play in the NHL but his defensive play has left much to be desired. Over the last four seasons, Del Zotto has a total goals-for of -41. The native of Stouffville, Ontario brought his DJ skills to the Canucks dressing room on his arrival in Vancouver. He mentioned in the offseason that he wanted to be a fun, veteran presence and also a leader in the locker room. He’s much more than that now. Ever since Edler’s injury, Del Zotto has been played like a number one defenceman. 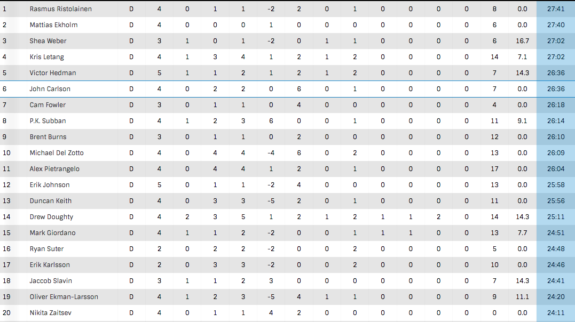 The Canucks were a team that allowed the third-most goals in the league last season. Now, they have Del Zotto who has averaged over 26 minutes per game. It’s been a mixed bag of results for him, which basically sums up his whole career. He does have four assists in six games, but he’s also been on the ice for 14 goals against in all situations. Gifmaster Jason Botchford of The Province did a good job of breaking down Del Zotto’s defensive gaffes against the Boston Bruins on Thursday. Green has shown a tendency to stick with the left-shooting defenceman on the left side with the right-shot defenceman on the right. Behind Del Zotto on the depth chart for left-handed defencemen is the erratic Ben Hutton and the newly acquired Derrick Pouliot. You can see the pickle that Green is in, but is there a way he could evenly spread out his ice time? There might be a boiling point where he has to shift the under-utilized Troy Stecher to the other side in order to decrease Del Zotto’s minutes. That is if the Canucks want to win games this season. The Canucks were going to need luck in order to compete this year. Having Del Zotto play like a bonafide number one defenceman does not equate to good luck. It could be a long 4-6 weeks, if Del Zotto can’t clean up the spotty defensive play that’s followed him throughout his career.